It’s being widely reported that T. Boone Pickens and Mesa Wind have placed an order for 667, 1.5MWe wind turbines as the first 25% of what will be the largest wind farm on the planet. The order, worth $2B and awarded to GE, will result in a plant in the Texas Panhandle that can power some 300,000 homes. Curiously, if one were to invest in a geothermal complex that could power the same number of homes, it would be 300MWe and cost about $900M. Sounds like it’s time for more education! Any way you cut it though, this is a great step to see an oil tycoon recognize the profit to made by supplying energy when the fuel is free. The only question we have is, what took so long? 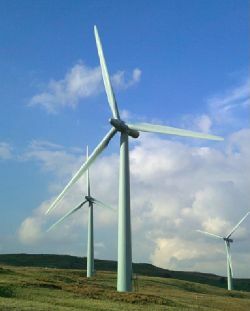 The company offers 4 variations of turbine with rotor diameters ranging from 1.2 to 6m and peak power output ranging from 0.2 to 3.8kW. Two distinct offers from the company include the SeaSpin microturbine for electricity production in maritime environments and WaterSpin, a pumping microturbine for agricultural environments. The other two offers are for residential and small business use for straight electricity generation. We will be curious to see how the small wind segment shakes out, there are clearly opportunities here if a company can hit the right price/performance/convenience ratio. About a year ago we wrote about Mariah Power’s Windspire vertical axis turbine intended to be packaged as an appliance. An update is in order now that the Reno, Nevada company has secured $1.25M in funding and is scheduled to produce and ship their first 50 turbines this month. The distinguishing characteristics about this approach is that the turbine is packaged as an appliance for consumer use and has a relatively low price point, $5,000 installed. The other compelling design feature is that the turbine is vertically oriented reducing noise, vibration, and avian complications. 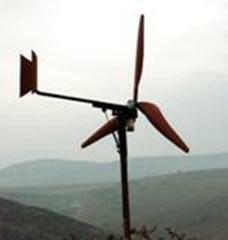 The device is expected to produce around 1,800 kwh per year and cuts in at 11 mph wind speed. Mariah is seeking expansion capital of more than $5M to grow their business starting with fulfilling their 1,200 customer orders for the Windspire turbine. In December, 2006, Return to the Age of Sail, we first reported on SkySails. The concept is simple, use an enormous kite-sail in conjunction with conventional propulsion to reduce the fuel requirement for cargo ships. Rather than investing in masts and extensive rigging, the SkySails approach is to fly a kite sail (which resembles a modern parachute in design) up to a kilometer above the ship. At this height, wind speed is substantially higher yielding better wind power results. In the maiden voyage of nearly 12,000 nautical miles, the reported performance was an aid of 20% resulting in a net savings of about 2.5 tons of fuel and more than $1,000 a day. This is our favorite kind of green project, it produces a good environmental benefit along with a strong tangible economic benefit.